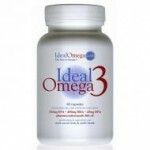 Ideal Omega is staffed by expert doctors who are passionate about omega-3. They have invested heavily in omega-3 research and carry out complex analysis that accurately state the blood levels of omega-3. Ideal Omega products are used by medical professionals, world famous clinics and even international sports stars and teams. Key point: Their supplements have a high content and high proportion of omega 3 essential fats.